Essex captain James Foster should be England's wicketkeeper this summer, says his county coach, Paul Grayson. The 34-year-old, whose last of seven Test appearances came in Australia in December 2002, has averaged 75.50 with the bat so far this season. "If Peter Moores wants an experienced keeper to do the job - we all know Fozzy is the best keeper in the country," Grayson told BBC Essex. "I really believe that James Foster deserves another opportunity." Foster's most recent international appearance came in a T20 international against West Indies in 2009. But new England head coach Peter Moores may have to consider his wicketkeeper options for the upcoming Test series against Sri Lanka and India, as Matt Prior struggled with the bat in the home and away Ashes series against Australia and this season has suffered a recurring Achilles tendon problem. Lancashire's Jos Buttler, England's current one-day and T20 wicketkeeper, has expressed his ambition to take on the role in Tests. 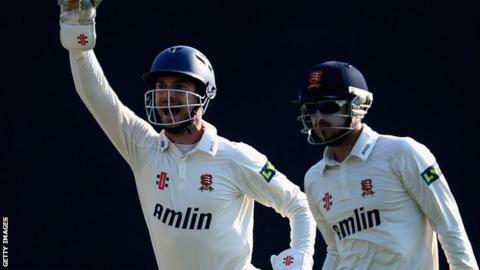 But Foster, who is a county team-mate of England captain Alastair Cook, has impressed for Essex this season, hitting 82 and an unbeaten 41 to help the Chelmsford side secure a draw against Leicestershire this week. However, Grayson said: "If Matt Prior is not going to be fit, Fozzy is in a very good place at the moment. "We know he is scoring some real vital runs for us and I'd like to see him get another opportunity to play for England. "It will come down to Peter Moores and Alastair Cook and the rest of the selectors. But I'd like to think that Ally has seen enough of Fozzy the past few weeks to know he is in a good place." Grayson believes Foster's age, compared to 23-year-old Buttler, should not prevent him from making an international return. "If you look at Australia at the moment - Brad Haddin is 36 - I don't think age should be an issue," he added. "Fozzy is at the top of his game and if he came back for England he would do a great job for the team."